good job look forward to seeing more! hey mate looks like you,v been busy, i tell ya what I've had and still own a few HQ,s and I've never personally seen rust like that in the roof line before do you think its had a vinyl roof at some stage, looks like a big job mate stick it out its looking good so far Cheers. Toad4.2 I don't know if Kingswood ever came out with vinyl roof. I was thinking maybe roof racks because the passenger side has gone in the same places. I am repairing that at the moment. My mate thinks its been on its lid but the rest of the rof panel is perfect, just these corners are gone. Here is the right rear quarter and as you can see i have already repaired the boot area. i needed to make the outer skin and I learnt from doing the roof that making a curved panel over a dive tank is good for only one direction of the curve, but when you need it to dish i am guessing thats when you need an English wheel. So i had a go at making one of them. easy to make not so easy to use. I have also made a 300mm folder to help with panels and also just finished a shrinker stretcher tool. All these tools i could have brought but being half dutch i was to tight and need the money for the car not tools. i will put pics up of the tools i made if anyone is at all interested. Anyway i used the english wheel very roughly the for a concave panel for the rear quarter. Just need a skim of filler over the welds and all should be good. i like to prime before i use filler as this car has had a lot of filler with no prime underneath and it has rusted under the filler. not sure what the right way is. My next part is the passengers side roof. its actually worse than the drivers. heres a glimpse. I will update as i go now so the updates will slow down haha. great work so far! Looking forward to your updates. Last edited by HQPREMWAGN; 08-06-2013 at 01:30 AM. I have made a patch to weld into the front corner of the roof and hopefully shrinkage will be minimal if I go very slowly and not too much heat. I figure if it turns ugly then I will try and find a donor roof. I have found Good panels are hard to find here in NZ and still run the risk buying someone else's rust. Wish it looked this good after I welded it. It has sunk in a bit where the weld is. Still only requires a small amount of filler over the weld. Put it this way it will have a lot less than when I started and hey I don't claim to be a seasoned professional haha. I will post a pic once I give it a quick undercoat before filling. This is the corner with an undercoat and no filler yet. You can see the slight shrinkage where it's welded. Oh well ever mind. Just got home from the All Blacks vs France game..... Go the mighty All Blacks. Not sure if the kingswoods came with a vinal roof anyone?? 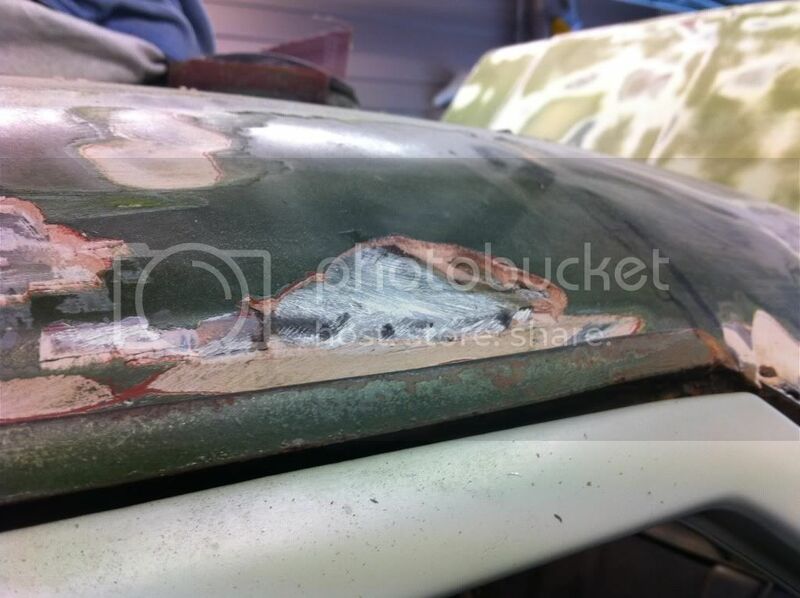 But with the rust on the roof corners like that it would of been my guess..
nice repairs mate looking good...! I Hope You Smoke...? Because If You Dont, Your Gonna Choke...!!! Can you post a pic of the tools you knocked up please..? Am I going over the top trying to fix other people's f$&k ups or am I doing the right thing?